The Holley LS Fest (East) was held this past weekend at Beech Bend Raceway Park in Bowling Green, Kentucky. A festival for all things LS and LT, the event proved to the world that the small-block Chevy engine is far from antiquated. This video from 1320 Video shows some of the engine’s capability. In full disclosure, records were broken, and so were a few parts. 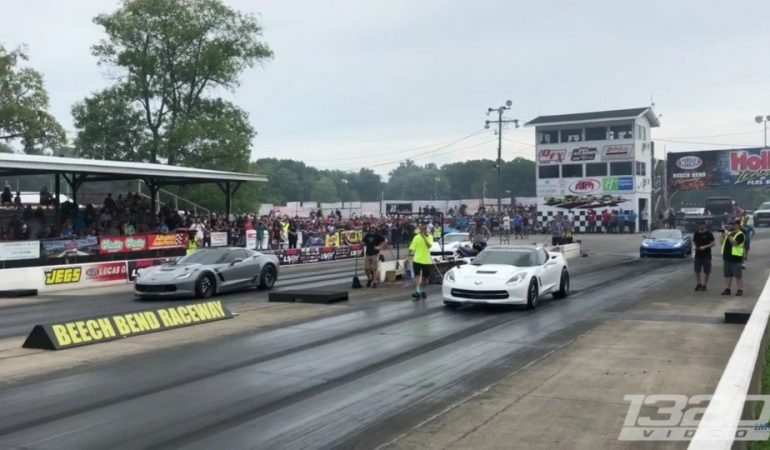 When pushing a car to the limit, sometimes that occurs before you reach the finish line, but if you’re lucky like the owner of this white Stingray Corvette, you may have enough in the bag to still carry home a record run. The Late Model Racecraft-prepared C7 was obviously highly modified. They offer packages for the C7 that range from 530 horsepower to almost double that amount. We’d figure that this particular car is at least maxed out in that regard. Other modifications reportedly included a powerglide trans, so the drivetrain is as modified as the engine. But it sure does run! In the video, you can see that those huge rear tires that stick out from the wheel wells give enough stick to pull the front wheels during launch. From there, it’s sucking air and fuel to try keep ahead of the grey Z06 of Justin Keith in the other lane. At around 1,000 feet, the car lays over and reportedly, a front seal is the cause for the smoke. Even so, the run is enough to cut the time well into the 8s with an 8.05 @164mph. That’s moving folks! Even so, with the potential for more and a seven-second run just a click away, we know that it won’t be long before we’re hearing of another amazingly-fast run as folks try to be the first into the sevens with their C7s! Next PostV6-1 – Nürburgring in 6:57?